Mardy Fish returns a shot to Ricardas Berankis. 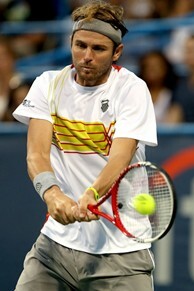 WASHINGTON (AP) -- Mardy Fish knows what he'd have to do for his ankle to heal. He's just not interested in doing it. Still feeling the effects of a right ankle injury sustained two weeks ago in Atlanta, the top-seeded American beat Ricardas Berankis 6-3, 6-1 on Thursday night to advance to the Citi Open quarterfinals. Fish said the injury doesn't hamper his movement, and he can play through the discomfort. Fish already missed time this year after he underwent a heart procedure in May to correct an arrhythmia. Now he's more concerned about regaining his match fitness than about his ankle. Fish will face Xavier Malisse on Friday. Malisse beat sixth-seeded Jeremy Chardy 6-3, 6-2. The No. 13-ranked Fish knows he isn't at top form, but he also believes he's not too far away. Eighth-seeded Sam Querrey also advanced, finishing off Benjamin Becker with his eighth ace of the match in a 6-4, 6-3 victory. Querrey, the Farmers Classic winner in Los Angeles on Sunday for his first title of the year, won all 24 of his first-serve points and on 22 of Becker's 33 second serves. Querrey will face third-seeded Kevin Anderson, a 6-4, 6-4 winner over Florent Serra. In the women's tournament, top-seeded Anastasia Pavlyuchenkova advanced to semifinals, beating Kai-Chen Chang 6-4, 6-4. Pavlyuchenkova was broken early and fell behind 4-1 before rallying to set up her first semifinal match of the year. The Russian reached the quarterfinals of the French Open and US Open in 2011, but struggled for much of this year. She reached the quarterfinals in Bastad, Sweden, in her last event. Fourth-seeded Vania King beat No. 7 Coco Vandeweghe 6-1, 3-6, 6-4. King broke Vandeweghe twice to take the first five games, and finished off the third set by breaking Vandeweghe for the fourth time. King will play Pavlyuchenkova in the semifinals Friday. King has won the last three matchups between the two. Magdalena Rybarikova advanced to the other semifinal with a 6-2, 6-4 victory over qualifier Jana Cepelova. She'll play third-seeded Sloane Stephens, a 6-4, 6-4 winner over Eugenie Bouchard.